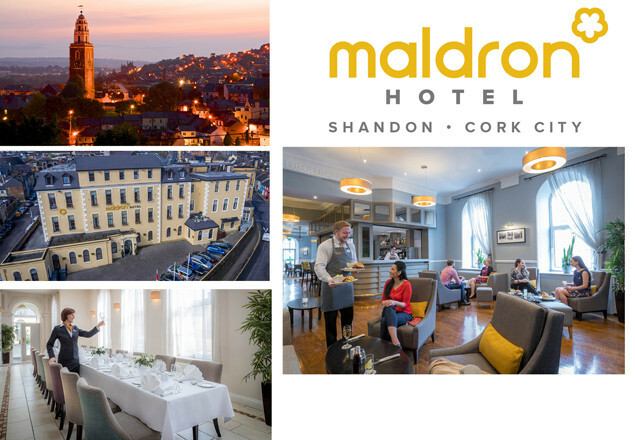 Rewarding Times are delighted team up with 4 star Maldron Hotel, Shandon, Cork City, to bring you a 2 night stay with fully vitality breakfast, one evening meal in Grain & Grill Restaurant, Lunch in the renowned Crawford art gallery café, and Vintage port and cheese in the room on arrival. All for just €269 for two people sharing a classic double room. The Maldron Hotel, Shandon, Cork City has been recently awarded 4 stars, and is located right in the heart of Cork City’s cultural quarter. 3 minutes’ walk to Cork Opera House, Opera Lane and Patrick’s Street. It has 101 newly refurbished guest bedrooms, all en-suite with tea/coffee making facilities. The Maldron Hotel Shandon Cork City's Grain & Grill Restaurant serves a contemporary menu crafted from the finest local ingredients accompanied by microbrew beers. Bells Bar serves coffees, light bites and bar food menu as well as a vast range of wines, beers and spirits. The Jack Lynch & Christy Ring Meeting rooms catering for up to 70 delegates. Club Vitae -Fitness your way! Boasting a 20m pool, steam room, sauna, spa pool and kiddies pool and a fully equipped cardio and free weight selection gymnasium with aerobics studio – complimentary use for all guests. Complimentary guest Wi-Fi throughout the hotel. Discounted Secure parking with Carroll’s Quay car park, just 3 minutes’ walk from the hotel. Exclusion dates: 23rd, 24th, 25th, 26th, 30th, 31st December 2017, 23rd & 24th February 2018.